The island of Menorca or Minorca as it is sometimes known, is the most northern of the Balearic Islands and the least commercialised. It is the second largest island in the Balearics and is well known for its unspoilt beaches and provides the perfect base for family holidays. It is approximately 35-miles long, by 9-miles wide with about thirty main beach resorts and many other small coves, bays and harbours dotting the coast line. Whether you prefer the rockier northern beaches or the golden sands of the south coast beaches, there are certainly plenty to visit during your holiday here and you will find the island is very family friendly. Throughout the island there are many excellent restaurants and of course bars, shops and places of interest to visit. Whilst it is not a night club centre such as its neighbour Ibiza, there is still plenty to do here and most of the evenings' activities centre around long leisurely dinners overlooking the water followed by a stroll round the waterside cafes which stay open as long as you want them to! However, the Cova d'en Xoroi in Cala’n Porter is a spectacular night club consisting of caves set into the cliff side rocks and is well worth a visit, during the day for coffee, for early evening drinks to watch the sun go down, or for the full on night club experience late at night! Menorca is charming and sophisticated and is a cosmopolitan island attractiving visitors from all over Europe as well as North and South America and the Antipodes. From most airports in the UK, flying time is approximately two hours and nowhere are the holiday villas and apartments further than say thirty minutes' drive from Mahon Airport. Mahon airport is modern and a second terminal building is being completed. The island is known for its leather/footware industry, the locally made jewelery and well as the cheese it produces which is well worth a try and there is a local brand of Gin named Xoriguer which is distilled on the Moll de Ponent harbor front in Mahon. 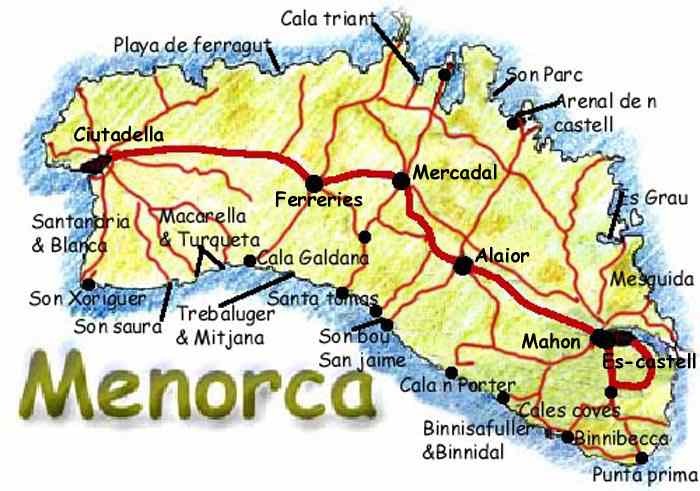 There are plenty of tourism and tourist information offices situated in the towns of Menorca, providing current information about local Menorca tourist attractions, beaches, museums, local events and festivals, sightseeing and general Menorca tourist information. Largely protected from development, Menorca is not your typical package holiday resort. The island's small towns and villages offer a fairly secluded and relaxed holiday, even during the peak season.